The teenage years can be a tricky time. Teens have to navigate newfound independence, more responsibility at school and at home, and, of course, surging hormones. The hormonal piece of teenage life almost always comes with a few bumps. As hormones like estrogen rush through the body for the first time, a breakout here and a bout of big emotions there will be totally normal. But the teenage years don’t have to be a crazy hormone roller coaster ride for young girls. 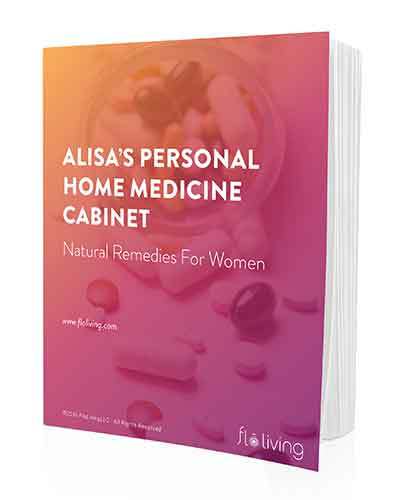 Intense cramping, horrible PMS, severe breakouts, intense emotionality, and heavy or irregular periods do not have to be part of your teenager’s life—now or in the future. You can help your daughter feel better now AND help set her up for a lifetime of symptom-free periods. It’s easy, and it is truly a gift that keeps on giving. A couple years ago, the menstrual cycle was declared the “fifth vital sign” of health for teenage girls by the American Committee of Obstetricians and Gynecologists (ACOG). Yep, you read that right: a young woman’s 28-day hormone cycle is considered as important as heart rate and blood pressure—and clinicians are encouraged to use the menstrual symptoms as early warning signs of reproductive health issues like PCOS, thyroid disease, and endometriosis, which can be indicated by abnormally long cycles, excessive bleeding, or lack of periods entirely. In the ACOG report, teenage girls are encouraged to track their periods and build awareness of their 28-day cycle. And this is my FIRST TIP for adults who want to help a teenager girl in their lives escape period problems: talk to your daughter about the importance of tracking her cycle so she knows if/when things go sideways with her hormones—when a period comes late or is overly heavy, for example, or when symptoms like acne are worse than normal. With knowledge comes power. When young girls know their cycle, they can tell when their hormones are sneaking out of balance—and they can take steps to balance them. A great way for girls to track their period is with the MyFlo app. The app will go with her wherever her phone goes….which, for most teenage girls, is everywhere! It’s easy to use and it will help teenagers with more than just tracking symptoms. The app can help girls and women (moms, this app is for YOU, too!) figure out why you or your daughter are having symptoms and what foods will help manage them. In addition it will teach your daughter all about how to use her cycle to her advantage – a conversation she certainly will not be getting in school! She’ll learn that it’s okay to be different each week, that it’s okay to change her activities based on her changing energy levels. She’ll learn that she doesn’t have to force herself to be the same every day, which I believe is at the root of the serious toxic condition of perfectionism which can have so many spin offs like anxiety, disordered eating, and more. Your daughter will have fun playing around with the best weeks to be social, the best weeks to curl up at home with a book, the best ways to manage a busy schedule, and the best ways to move your body during each phase of your cycle. Instead of being moody, and in the dark about what is happening to her, she’ll be empowered. So the first place to start is a conversation about the importance of understanding your cycle and tracking your cycle. Here’s what comes next…. Helping teens have a healthy period—right now and for the rest of their lives—goes far beyond teaching them how to use a tampon or pad. Lead by example. It’s like that familiar airplane-safety schpeel: “Help yourself before you help others.” Your daughter will learn the most by watching what you do. Actions speak louder than words. So your best first step is to adopt The Cycle Syncing Method™ when it comes to what you eat and how you exercise. And if you haven’t yet addressed your hormonal issues, let her know what your issues are, and that you are embarking on this exciting journey of hormonal recovery for yourself. As Michelle Obama said, “I think it’s the worst thing that we do to each other as women, not share the truth about our bodies and how they work.” I couldn’t agree more! Talk about your period honestly and how not knowing about how to take care of it really affected every area of your life. The next generation doesn’t have to suffer if we help them. Make education a priority. Menstrual education goes far beyond how to put in a tampon. Adult women need to support teens beyond the practicalities. My book, WomanCode, does a deep dive on The Cycle Synching Method™. Another great resource for teens is the book Cycle Savvy by Toni Weschler (who wrote the comprehensive cycle-knowledge bible Taking Charge of Your Fertility). Help teens avoid hormonal birth control as the first treatment for period problems. When young women experience period problems like heavy or irregular periods, severe acne, horrible cramps, and nightmare PMS, many clinicians’ first instinct is to put them on the pill. But this ‘treatment,’ which is really a form of covering up the root causes of period problems instead of fixing underlying hormone imbalances, does girls a big disservice. If the teen in your life is dealing with reproductive health issues like those mentioned in the ACOG report, then consulting a doctor is an important part of getting her back on track. However, we must always question the prescription of hormonal birth control as it never treats the underlying health issue, but only masks the symptoms. Once your teen decides to come off, and this might be years down the line, she will discover that the health issue will return and possibly be worse than before. If the teen in your life is dealing with very common problems like acne or PMS, then the pill is not the answer. While it can be tempting to reach for these drugs to put a stop to the problem, it’s important to know that doing so can set a young women up for a lifetime of side effects—including depression, low libido, anxiety, hair loss, cancer risk, and even life-threatening blood clots—and suppressed functioning of her endocrine, metabolic, and immune systems. Read up on the negative side effects of the pill and share those with your daughter. In every situation, a the women I’ve worked with who suffered with synthetic birth control syndrome wished she had been told that negative side effects were even a possibility, that her future fertility might be affected, and that she had known there was a natural solution to her condition. Talk to your teen about food. 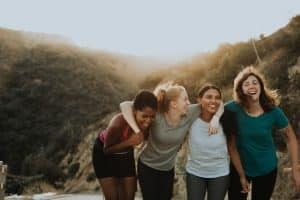 A main source of hormone imbalance in teenage girls is diet, with busy high schoolers eating sugary snacks on the run, indulging in late-night eating, skipping breakfast, and generally ignoring the food-hormone connection. Food is one of the most powerful levers we can pull to balance hormones and have better periods. If your teenage daughter is plagued by symptoms like acne and crippling PMS, shifting how she eats is key. Talk with your daughter about the food-hormone connection and emphasize the importance of eating plentiful amounts of dark, leafy, greens (to support liver detox and the movement of excess hormones out of the body), eating foods rich in key hormone-supportive micronutrients, and eating enough (healthy) calories to support metabolic functions and optimal micronutrient levels. Talk about the dangers of too much processed sugar and how caffeine can sabotage hormone health. Keep toxic chemicals away from developing bodies. The endocrine-disrupting chemicals found in many everyday products, from makeup and perfumes to household cleaners, are hormone disruptive for every women—but they can be especially hard on young bodies that are still developing. Make sure your daughter has access to clean makeup, safe deodorant, and non-toxic soap, lotions, shampoos. Banish toxic household cleaners and other chemicals (like pesticides) for the health of the whole family. Introduce your teen to the FLO Protocol. The FLO Protocol is all about engaging in phase-based self care and it is as applicable for teens as it is for adults. There is absolutely no reason that you are you daughter can’t adopt the FLO Protocol together.